Please call to confirm inventory, Thank you! Why let the big guys have all the fun? We know your 1/2-ton pickup is capable of the toughest jobs, which is why we created the Meyer Super-V Light Duty (LD). With a plow spanning 7’6" in length, the Super-V LD has trip-edge moldboards for more efficient and shock-absorbent plowing. One-half ton trucks don’t seem light at all with a Meyer Super-V LD plow attached. Blade Model #: Super-V2 SS 9' 6"
Performance: When you want the convenience of a "V" blade, scoop blade or straight blade, you want a Meyer Super-V plow. Our exclusive one-button controller lets you put the plow in just about any configuration. The dual-acting cylinders lock the blade so you can back drag snow in any blade position. Double-Acting Cylinders: Why pay for a lock-out system when you don’t have to? Back drag snow more efficiently than ever with our standard locking double-acting cylinders on our Super-V LD plow. Whether going forward or backward, just set the angle you want and the blade position is locked on the V plow. Trip-Edge Design: Unlike competitive models, all Super-Vs have trip-edge moldboards. This means that no matter how the moldboards are configured, only the lower portion of the blades give way so the entire load is not lost. Not only does the trip-edge make plowing more efficient, it also absorbs and dissipates the shock caused by obstructions saving wear and tear on the driver, truck and snow plow. Upper and Lower Deflectors: An exclusive upper-sealed center deflector, along with optional wing deflectors, keep snow and ice off your windshield. The standard lower-sealed center deflector never leaves snow trails behind, so there is no mess to clean up after using your V plow. Dura-Slick Paint with Teflon®: All Meyer carbon steel moldboards are painted with Meyer Dura-Slick™ Paint. This automotive-style paint with Teflon® is baked on to the steel for durability and better snow-rolling action. 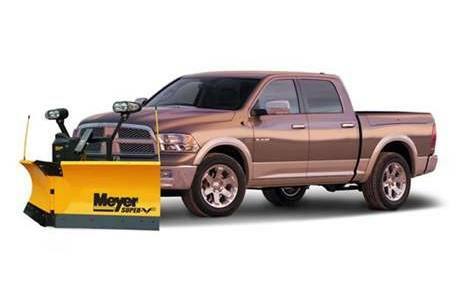 It's the reason why Meyer plows throw snow farther and move it faster than the competition. Reliability: In the snowplowing business, downtime is not an option. That’s why the Super-V LD is built using Reliable Over-time Construction (ROC)… the detailed things we do to make our plows more rugged and reliable. ROC is the result of manufacturing improvements and state-of-the-art technology combined with stringent quality control procedures. Slot and Tab Construction: Meyer couldn't offer the industry's best warranty on our plows if we didn't build them using slot and tab construction. This method of construction makes for a stronger, more precise fitting plow. Laser cut steel components are assembled using robotic welders that never tire and never make a mistake. It's why every plow comes off the line ready to provide years of trouble-free service. Continuously Welded Ribs: Meyer plows are continuously welded on the outside ribs. This Meyer exclusive not only gives our plows a more rugged look, but more importantly, it increases their strength and performance so they can handle anything Mother Nature sends their way. Pre-drilled Deflector Holes: Meyer Super-V LD moldboards are manufactured with pre-drilled holes, which makes it easy to add a snow deflector. This means you save time when adding this important safety feature that prevents snow from impairing your view through the windshield. Since they are pre-drilled at the factory, the holes are sealed with Dura-Slick paint to help prevent rust. Reliable and Responsive Operation: The driving force behind every Meyer snowplow is a reliable and responsive hydraulic system. Triple-layered sealed coils and connectors virtually eliminate corrosion and moisture often found in electrical and mechanical systems. And unlike competitive systems, all Meyer hydraulic systems ship standard with custom-molded covers to help protect the units from road salt and grime. 5-Year America's Best Warranty: Meyer is proud to offer a full five-year warranty on complete plow systems with an online registration. The competition can’t beat that. Ease of Use: When it’s cold, wet and dark, struggling with a stubborn snow plow is the last thing you want to do. That’s why Super-V LD has our EZ-Mount Plus mounting system conveniently attaches or detaches in well under a minute and leaves the vehicle with an off-the-assembly-line appearance when not attached. Unlike competitors that have up to three plugs, the EZ-Mount Plus system comes with just one patented plug to connect/disconnect. And Meyer’s free-standing jack stand allows you to adjust the plow’s height on uneven or shifting surfaces for easy on/off. Hands-Free Plowing - A Meyer Exclusive: Meyer’s exclusive EZ-1 deluxe pistol grip controller lets you put the plow in just about any configuration at the touch of one button. The EZ-1 deluxe controller also features diagnostics and a Hands-Free Plowing (HFP) mode. When activated HFP uses the shift lever to control the up/down movement of the blade. The EZ-1 controller comes with double-click technology. Simply double-click a button, and the moldboard automatically moves in that direction without having to keep your finger on the button. One-Piece Plug (Patented): Unlike competitors who have up to three plugs, the Meyer EZ-Mount Plus system comes with a one-piece patented plug to connect/disconnect the plow from the vehicle. No more fumbling in the middle of the night trying to figure out which plug goes where. The one-piece plug gets you back in the cab faster and easier. System Diagnostics: When you're out plowing, issues arise. Meyer makes it easy to get you back on the road using our system diagnostics found on the back of our pistol grip controllers. Just match the controller's flashing light sequence with the chart on the back of the controller to isolate the issue. Not only does this reduce your downtime, it gets you back doing what you do best – plowing snow. Field Adjustable Trip Springs: While out plowing, contractors often need to make adjustments to their plow, and they don't want to go back to the shop to do it. That is why Meyer makes their plows with field adjustable trip springs. This allows more time to plow and less time back at the shop. Better Lights for Better Sight: It’s hard to plow what you can’t see, so all Meyer snow plows come with dual halogen Nite Saber® III lights. They are fully adjustable and iso-mounted to resist vibration. The Nite Saber lights feature easy-to-replace dual halogen bulbs and wrap-around turn signals. Fleet Management: EZ-Mount Plus mounting systems are fleet-friendly because the Super-V LD and Lot Pro LD moldboards and controllers are interchangeable. Super-V LD moldboards can also be attached to our time-tested EZ-Mount Classic® mounting systems.